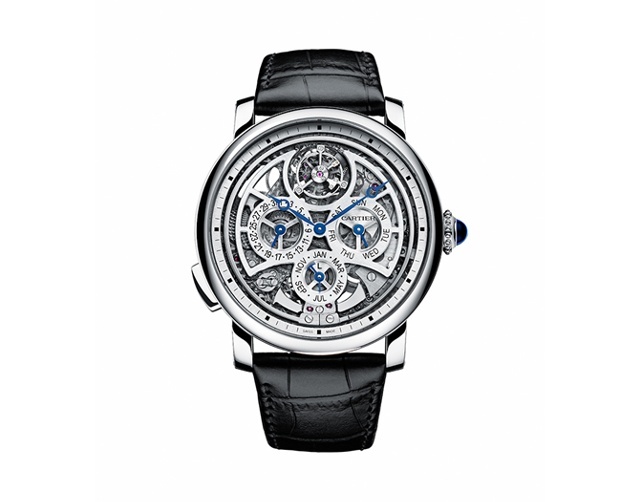 After five years in development, Cartier introduced this week the Rotonde de Cartier Grande Complication watch. The timepiece features 578 components and requires 15 weeks of production at the Manufacture, 10 weeks of decorating and finishing and five weeks of assembly. 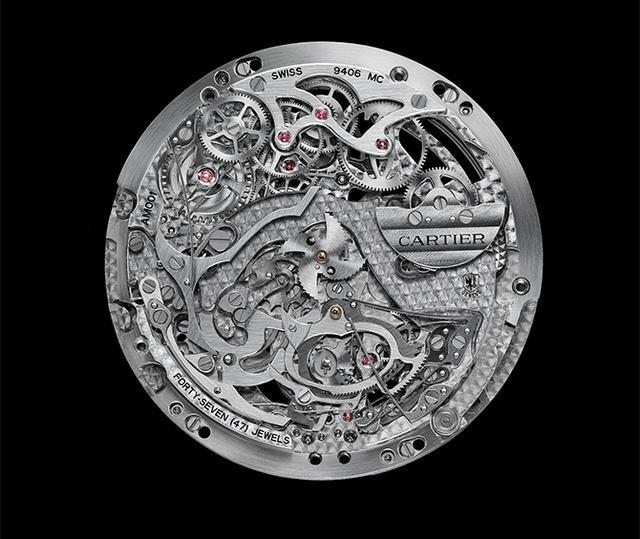 This platinum, 45 millimeter watch is equipped with the self-winding skeletonized caliber 9406 MC. At a thickness of 5.49 mm for a self-winding mechanical movement, it artfully combines three fine watchmaking complications: a perpetual calendar, a minute repeater and a flying tourbillon. Cartier focused its attention on the calibre 9406 MC’s minute repeater, endowing it with some interesting features: the minute repeater is prominently displayed on the dial, with gongs and hammers in full view. Its inertia fly-wheel is freed of its upper bridge, making it truly fly. And the sound is, well, amazing. The Rotonde de Cartier Grande Complication watch is Poinçon de Genève-certified, and the self-winding calibre is assembled and set in the Maison’s Fine Watchmaking workshops, located in Geneva just above the Cartier boutique at 35 rue du Rhône. The watch comes on a black alligator leather strap.